John Carmack, the brains behind the FPS-defining Doom and Wolfenstein 3D, will be honored for his contributions to gaming at GDC with a Lifetime Achievement Award. John Carmack is a lot of things. He's the co-founder and legendary technical director of id Software who designs and codes iPhone ports for his titles because he feels like it. He's a genuine award-winning rocket scientist. He's also the man behind Wolfenstein 3D, Doom and Quake, titles that defined an era and kickstarted the FPS, arguably the most prolific genre we see today. The choice to award the Lifetime Achievement Award to Carmack was made by a panel of notable people in the industry including BioWare's Dr. Ray Muzyka, PopCap's John Vechey, and Ubisoft's Clint Hocking. When he receives said award on March 11th, Carmack will join a very elite club that includes names like Shigeru Miyamoto, Sid Meier, and Will Wright (who will, in fact, be the one giving Carmack the award). I certainly can't disagree with the choice to honor Carmack with this award, because the man has played a hugely instrumental role in establishing the modern games industry as we know it. There was a good while where FPS titles were all called "Doom clones" before we settled on "First-Person Shooter," much like how sandbox games were called "Grand Theft Auto clones" in the earlier... actually, we still call them that, don't we? Huh. 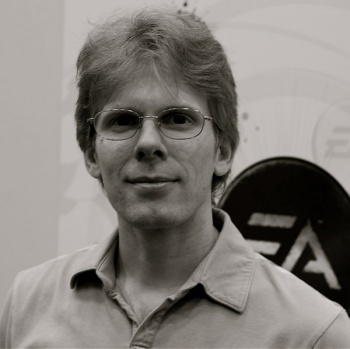 The most incredible part about the whole thing is that Carmack doesn't turn 40 until this August - he's earned a Lifetime Achievement Award at the age of 39. Impressive - and congratulations, John Carmack, you've certainly earned it. I wonder who will be up next year?